Many people start the New Year with great intentions but quickly get bored. If you're not used to going to the gym or running and you don't really know what to do it can be sort of awkward and demoralising wondering around the machines. Don't forget, everyone else is more worried about themselves, their workout, their day, what they're going to have for tea, that they won't be paying any attention to you. Still not convinced here's my top 3 tips to keep motivation levels high. I don't mean one of those beige classes in chain gyms where the instructor stands at the front and shouts at you for 45 minutes I mean something new. And given that's January, something free! What about Speedflex? They've got studios across the country from Newcastle to London and their classes are the perfect thing for anyone knew to weightlifting. Speedflex is a circuit based class with machine, body and free-weight exercises. The machines are so super fancy that they adjust the weight for you depending on the effort level you put in. Plus the machines guide you through the correct movement pattern which is brilliant for anyone who wants to get into lifting weights but doesn't know where to start. The studio in London has battle ropes, an absolute fat torching exercise and good fun. The great news .... they are doing a two week free trial at the moment AND they offer 30 minute classes so you can squeeze it in at your lunch break. Training with a friend means that not only can you catch up whilst your spotting each other on the weights you are also 25%* more likely to train if you're meeting your bestie than if you're slogging it out alone. In fact, studies show ta 95% adherence rate to programmes when taking part with a friend. There's also a 15% chance that you'll both just sack off the gym and get a glass of wine instead - okay so I've made that last stat up but the first two come from a real (albeit old) medical paper. I know it's January and money is tight but getting some new kit can really help to boost your motivation to get out and make those training sessions happen. I love running in my head torch and getting Gatsby new little lights recently made me want to get out and give them a go. I am a huge fan of Start Fitness and used to visit the store regularly when I lived in Newcastle, but they have a huge online store and some fab deals, including 10% off your first order. Having new kit to test out really does help to get you out the door and into your session. I'd love to know your top tips for keeping up the January momentum. Thank you Action PR for inviting me to join you to try out a complimentary Speedflex session with you. 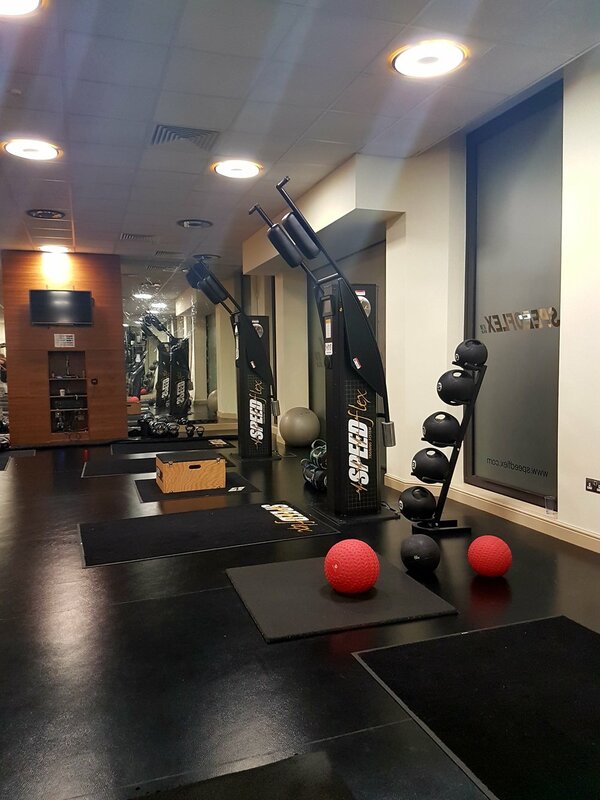 Speedflex sessions include movements on the Speedflex machines, step-ups, battle-ropes, kettle bells and wall balls.